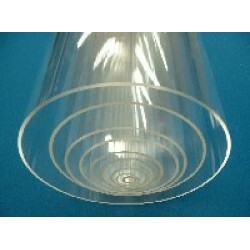 Clear Acrylic Tube 100mm x 3mm x 2000mm Outside Diameter: 100mm Inside Diameter: ..
Clear Acrylic Tube 100mm x 5mm x 1000mm Outside Diameter: 100mm Inside Diameter: ..
Clear Acrylic Tube 100mm x 3mm x 1000mm Outside Diameter: 100mm Inside Diameter: ..
Clear Acrylic Tube 100mm x 5mm x 2000mm Outside Diameter: 100mm Inside Diameter: ..
Clear Acrylic Disc 100mm x 5mm Diameter: 100mm Thickness: 5mm Colour: Clear ..
Clear Acrylic Tube 100mm x 5mm x 500mm Outside Diameter: 100mm Inside Diameter: 9..
Clear Acrylic Tube 100mm x 3mm x 500mm Outside Diameter: 100mm Inside Diameter: 9..
Clear Acrylic Tube 100mm x 4mm x 1000mm Outside Diameter: 100mm Inside Diameter: ..
Clear Acrylic Tube 100mm x 4mm x 2000mm Outside Diameter: 100mm Inside Diameter: ..
Clear Acrylic Tube 100mm x 4mm x 500mm Outside Diameter: 100mm Inside Diameter: 9..
Clear Acrylic Disc 100mm x 3mm Diameter: 100mm Thickness: 3mm Colour: Clear ..
Clear Acrylic Disc 100mm x 10mm Diameter: 100m Thickness: 10mm Colour: Clear ..
Clear Polycarbonate Tube 100mm x 2.5mm x 1000mm Outside Diameter: 100mm Inside Di..
Clear Polycarbonate Tube 100mm x 2.5mm x 2000mm Outside Diameter: 100mm Inside Di..
Clear Polycarbonate Tube 100mm x 2.5mm x 500mm Outside Diameter: 100mm Inside Dia..
Clear Polycarbonate Tube 100mm x 3mm x 1000mm Outside Diameter: 100mm Inside Diam..
Clear Polycarbonate Tube 100mm x 3mm x 2000mm Outside Diameter: 100mm Inside Diam..
Clear Polycarbonate Tube 100mm x 3mm x 500mm Outside Diameter: 100mm Inside Diame.. Mirrored Acrylic Disc 100mm x 3mm Diameter: 100mm Thickness: 3mm Colour: Mirro.. Mirrored Acrylic Disc 20mm x 3mm Diameter: 20mm Thickness: 3mm Colour: Mirrore.. Mirrored Acrylic Disc 22mm x 3mm Diameter: 22mm Thickness: 3mm Colour: Mirrore.. Mirrored Acrylic Disc 24mm x 3mm Diameter: 24mm Thickness: 3mm Colour: Mirrore.. Mirrored Acrylic Disc 25mm x 3mm Diameter: 25mm Thickness: 3mm Colour: Mirrore.. Mirrored Acrylic Disc 28mm x 3mm Diameter: 28mm Thickness: 3mm Colour: Mirrore.. Mirrored Acrylic Disc 30mm x 3mm Diameter: 30mm Thickness: 3mm Colour: Mirrore.. Mirrored Acrylic Disc 32mm x 3mm Diameter:32mm Thickness: 3mm Colour: Mirrored.. Mirrored Acrylic Disc 34mm x 3mm Diameter: 34mm Thickness: 3mm Colour: Mirrore.. Mirrored Acrylic Disc 36mm x 3mm Diameter: 36mm Thickness: 3mm Colour: Mirrore.. Mirrored Acrylic Disc 38mm x 3mm Diameter: 38mm Thickness: 3mm Colour: Mirrore.. Mirrored Acrylic Disc 40mm x 3mm Diameter: 40mm Thickness: 3mm Colour: Mirrore.. Mirrored Acrylic Disc 56mm x 3mm Diameter: 56mm Thickness: 3mm Colour: Mirrore.. Mirrored Acrylic Disc 50mm x 3mm Diameter: 50mm Thickness: 3mm Colour: Mirrore.. Mirrored Acrylic Disc 60mm x 3mm Diameter: 60mm Thickness: 3mm Colour: Mirrore.. Mirrored Acrylic Disc 70mm x 3mm Diameter: 70mm Thickness: 3mm Colour: Mirrore.. Mirrored Acrylic Disc 80mm x 3mm Diameter: 80mm Thickness: 3mm Colour: Mirrore.. Mirrored Acrylic Disc 76mm x 3mm Diameter: 76mm Thickness: 3mm Colour: Mirrore.. Mirrored Acrylic Disc 90mm x 3mm Diameter: 90mm Thickness: 3mm Colour: Mirrore.. Mirrored Acrylic Disc 125mm x 3mm Diameter: 125mm Thickness: 3mm Colour: Mirro.. Mirrored Acrylic Disc 127mm x 3mm Diameter: 127mm Thickness: 3mm Colour: Mirro.. Mirrored Acrylic Disc 130mm x 3mm Diameter: 130mm Thickness: 3mm Colour: Mirro.. Mirrored Acrylic Disc 134mm x 3mm Diameter: 134mm Thickness: 3mm Colour: Mirro.. Mirrored Acrylic Disc 140mm x 3mm Diameter: 140mm Thickness: 3mm Colour: Mirro.. Mirrored Acrylic Disc 150mm x 3mm Diameter: 150mm Thickness: 3mm Colour: Mirro.. Mirrored Acrylic Disc 160mm x 3mm Diameter: 160mm Thickness: 3mm Colour: Mirro.. Mirrored Acrylic Disc 170mm x 3mm Diameter: 170mm Thickness: 3mm Colour: Mirro.. Mirrored Acrylic Disc 180mm x 3mm Diameter: 180mm Thickness: 3mm Colour: Mirro.. Mirrored Acrylic Disc 185mm x 3mm Diameter: 185mm Thickness: 3mm Colour: Mirro.. Mirrored Acrylic Disc 190mm x 3mm Diameter: 190mm Thickness: 3mm Colour: Mirro.. Mirrored Acrylic Disc 200mm x 3mm Diameter: 200mm Thickness: 3mm Colour: Mirro.. Mirrored Acrylic Disc 220mm x 3mm Diameter: 220mm Thickness: 3mm Colour: Mirro.. Mirrored Acrylic Disc 230mm x 3mm Diameter: 230mm Thickness: 3mm Colour: Mirro.. Mirrored Acrylic Disc 240mm x 3mm Diameter: 240mm Thickness: 3mm Colour: Mirro.. Mirrored Acrylic Disc 250mm x 3mm Diameter: 250mm Thickness: 3mm Colour: Mirro.. Mirrored Acrylic Disc 260mm x 3mm Diameter: 260mm Thickness: 3mm Colour: Mirro.. Mirrored Acrylic Disc 270mm x 3mm Diameter: 270mm Thickness: 3mm Colour: Mirro.. Mirrored Acrylic Disc 280mm x 3mm Diameter: 280mm Thickness: 3mm Colour: Mirro.. Mirrored Acrylic Disc 300mm x 3mm Diameter: 300mm Thickness: 3mm Colour: Mirro.. Mirrored Acrylic Disc 310mm x 3mm Diameter: 310mm Thickness: 3mm Colour: Mirro.. Mirrored Acrylic Disc 320mm x 3mm Diameter: 320mm Thickness: 3mm Colour: Mirro.. Mirrored Acrylic Disc 330mm x 3mm Diameter: 330mm Thickness: 3mm Colour: Mirro.. Mirrored Acrylic Disc 340mm x 3mm Diameter: 340mm Thickness: 3mm Colour: Mirro.. Mirrored Acrylic Disc 350mm x 3mm Diameter: 350mm Thickness: 3mm Colour: Mirro.. Mirrored Acrylic Disc 360mm x 3mm Diameter: 360mm Thickness: 3mm Colour: Mirro.. Mirrored Acrylic Disc 370mm x 3mm Diameter: 370mm Thickness: 3mm Colour: Mirro.. Mirrored Acrylic Disc 380mm x 3mm Diameter: 380mm Thickness: 3mm Colour: Mirro.. Mirrored Acrylic Disc 390mm x 3mm Diameter: 390mm Thickness: 3mm Colour: Mirro.. Mirrored Acrylic Disc 400mm x 3mm Diameter: 400mm Thickness: 3mm Colour: Mirro.. Mirrored Acrylic Disc 410mm x 3mm Diameter: 410mm Thickness: 3mm Colour: Mirro.. Mirrored Acrylic Disc 420mm x 3mm Diameter: 420mm Thickness: 3mm Colour: Mirro..